OTTAWA — Senator Doug Finley led a call Tuesday to scrap a section of Canada's Human Rights Act that he and other Conservative senators say is being used to stifle free speech in Canada. 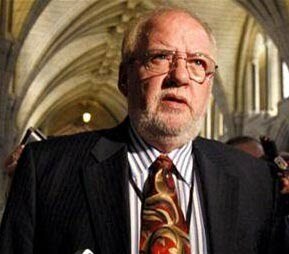 Finley was one of a quartet of Tory senators to lead a Senate inquiry into free speech rights in Canada, rights they felt had come under attack when the speech by a controversial American pundit at an Ottawa university was cancelled and again when a woman in Vancouver sued a comedian because she didn't like jokes aimed at her. "Despite our 400-year tradition of free speech, the tyrannical instinct to censor still exists," Finley said. "We saw it on a university campus last week. And we see it every week in Canada's misleadingly named human rights commissions." But Tuesday's Senate inquiry was not led by just any senator. Finley is a close confidante of Prime Minister Stephen Harper and the architect of both of Harper's election victories. He is also the spouse of Human Resources Minister Diane Finley. And that section of the Human Rights Act has been particularly irksome to many conservatives in Canada who view it as a symptom of the worst excesses of the politically correct left. Senator Finley said he has encouraged his colleagues in cabinet, particularly Justice Minister Rob Nicholson, to review the speech he gave in the Senate Tuesday with an eye toward reconsidering a re-write of one part of Canada's Human Rights Act. That section, which prohibits speech that is likely to expose a person or a group to hatred or contempt, has been used as the basis of complaints against journalists and others. "Too many Canadians, especially those in positions of authority, have replaced the real human right of freedom of speech with a counterfeit human right not be offended," Finley told the Senate. Conservative Senators Pamela Wallin and Mike Duffy, both former journalists, also spoke in favour of Finley's inquiry. "Prosecuting the actions of journalists was clearly not the intention of Parliament when it passed hate speech laws," Duffy said. In addition to the Coulter example, Finley also cited a lawsuit in British Columbia in which a comic is defending comments he made about gays and lesbians after a lesbian woman heckled him on stage. The man could be fined up to $20,000 for those remarks. "They may have been offensive. But what's more offensive is that a government agency would be the arbiter of good taste or humour," Finley said. Finley conceded that while the federal government can do little about the B.C. case because of jurisdictional issues, he wanted his inquiry to look into the details surrounding the Coulter case; "to show moral support for those who are battling censors:" and to investigate what, if any changes, might be required to Canada's Human Rights Act. "Too many Canadians, especially those in positions of authority, have replaced the real human right of freedom of speech with a counterfeit human right not to be offended," Finley said. "If we can rededicate our parliament to protecting this most important right, we will have done our country a great service," Finley said. "But if we fail to stop and indeed reverse this erosion of freedom, we will have failed our most basic duty — the duty to uphold our Constitution and the rights it guarantees for all Canadians." "But the mob took its cue from the provost," Tkachuk told the Senate. The provost, university vice-president Francois Houle, sent a letter to Coulter before the event cautioning her about Canada's speech laws, specifically the prohibitions in the human rights act. Finley is a close confidante of Prime Minister Stephen Harper and the architect of both of Harper's election victories. He is also the spouse of Human Resources Minister Diane Finley... "Too many Canadians, especially those in positions of authority, have replaced the real human right of freedom of speech with a counterfeit human right not be offended," Finley told the Senate. John Milton, the great poet who wrote Paradise Lost, was constantly hounded for his political views. His 1644 pamphlet on free speech, called Areopagitica, is perhaps the greatest defence of free speech ever written, and it is as relevant today as it was 350 years ago. In it, Milton wrote, quote, 'let [truth] and falsehood grapple; who ever knew truth put to the worse, in a free and open encounter? and Who kills a man kills a reasonable creature… but he who destroys a good book, kills reason itself. Yet, despite our 400 year tradition of free speech, the tyrannical instinct to censor still exists. We saw it on a university campus last week. And we see it every week in Canada’s misleadingly-named human rights commissions. This week, in Vancouver, a stand-up comedian named Guy Earle goes on trial before the B.C. human rights tribunal for the crime of telling jokes that someone didn’t find funny. An audience member who heckled him is suing him for $20,000 because she found his retorts offensive. They may have been offensive. But what’s more offensive is that a government agency would be the arbiter of good taste or humour. Nobel Prize winner Aleksandr Solzhenitsyn was sentenced to eight years of hard labour for telling a joke about Stalin’s moustache. It’s a disgrace that Canada is now putting comedians on trial, too. Earle has already spent $20,000 defending himself. One of the problems with censorship is that the definition of what's offensive is open to political bias. Maclean's columnist Mark Steyn was put on trial for a week in Vancouver for merely expressing his political views. Ezra Levant and the Western Standard magazine were prosecuted for 900 days for illustrating a news story about the Danish cartoons of Mohammed with eight of those cartoons. Prosecuting those acts of journalism was clearly not the intention of Parliament when hate speech laws were enacted. And the chilling effect has been much wider than just these and a few other notorious prosecutions. How many other journalists have quietly decided to pull their punches on controversial issues, just to avoid a nuisance suit or human rights complaint? How many TV and radio stations have avoided vigorous discussions of controversial issues, out of fear of censorship from the Canadian Broadcast Standards Council, acting on behalf of the CRTC..? This not hypothetical; in 2004, a handful of complaints convinced the CRTC to yank the licence of CHOI-FM, one of Quebec's most popular radio stations. Imagine that -- a government order that, had it been allowed to stand, would have destroyed dozens of careers, a successful business, all because of hurt political feelings. That's how Hugo Chavez handles radio stations he doesn't like. But that's just not the Canadian way. The tepid response from University of Ottawa President Allan Rock came with his head firmly planted in the sand: He wrote, and I quote: 'We have a long history of hosting contentious and controversial speakers on our campus. [Tuesday] night was no exception, as people gathered here to listen to and debate Ann Coulter's opinions.' In other words: 'It wasn’t us that stopped her from speaking.' Which is a little like the owner of an arena saying we didn’t say you can’t play hockey, while he let the ice melt. If A.J. Liebling is correct that 'freedom of the press is guaranteed only to those who owe one,' then let us take a page from his legendary book and remember that we own our own thoughts, ideas and speech. We own them, so let us use them and defend them. It is our responsibility as citizens. I have seen the effect that private stations, such as Radio Télévision Libre des Mille Collines, can have. That station was instrumental in the events that transpired and was known as genocide radio. Everyone seems to want to blame the Human Rights Commission. There is a debate going on about human rights and the limits of those rights. Perhaps it would be useful to have a minister or a political person appointed to be responsible for human rights instead of allocating that responsibility to a dozen departments, whose public servants do not really take the time to understand the Charter or to adapt the restrictions therein to modern-day human rights and privileges. This debate is extremely pertinent. This very week, a comedian is on trial for his jokes. And, if that seems like some wacky anomaly in an otherwise sound system, don't be fooled. It's a conscious power grab by Heather MacNaughton, Chief Commissar of the British Columbia "Human Rights" Tribunal and the buffoon jurist who presided over the Maclean's show trial. The BC Supreme Court cautioned the HRT against proceeding to trial on the grounds that it was unclear whether they had jurisdiction. Commissar MacNaughton decided instead to hold the trial, and then consider whether they had jurisdiction. You can see Guy Earle's lawyer walking out in protest here. I hope he knows what he's doing. When the Maclean's case came up and I said why don't we tell 'em to screw off, it was explained to me by the QCs that, if you decline to participate in the trial, you can't appeal the verdict to a real court. In Canada, not only do you not have free speech, but you're obliged to pay for the apparatchiks' speech. François Houle, the riot-inciting Provost of the University of Ottawa, gets paid $166,921.80 per annum to send sneering e-mails threatening criminal prosecution to Ann Coulter, but to no other speakers. Why should M Houle's or Commissar MacNaughton's highly partisan ideological warfare be taxpayer-funded? Why can't they do it on their own dime, like me and Ezra and Ann? Disagreement is freedom; complete agreement is totalilitarian. It's as simple as that. That he will call the attention of the Senate to the issue of the erosion of Freedom of Speech in our country. He said: Honourable senators, I rise to call the attention of the Senate to the erosion of freedom of speech in Canada. There can scarcely be a more important issue than this one. Freedom of speech is, and always has been, the bedrock of our Canadian democracy. The great Alan Borovoy, who was the head of the Canadian Civil Liberties Association for more than 40 years, calls freedom of speech a "strategic freedom" because it is a freedom upon which all other freedoms are built. For example, how could we exercise our democratic right to hold elections without free speech? How could we have a fair trial without free speech? What is the point of freedom of assembly if we cannot talk freely at such a public meeting? Freedom of speech is a most important freedom. Indeed, if we had all our other rights taken away we could still win them back with freedom of speech. Benjamin Franklin once said: "Without Freedom of thought, there can be no such Thing as Wisdom; and no such thing as public Liberty, without Freedom of speech." Freedom of speech is embedded in Parliament's DNA. The word "Parliament" itself comes from the French word "parler," to speak. As parliamentarians we guard our freedom jealously. No member of the House of Commons or the Senate may be sued for anything that is said in Parliament. Our freedom of speech is absolute. Yet, only last week, a few miles from here, censorship reared its ugly head. Ann Coulter, an American political commentator, had been invited to speak at the University of Ottawa. Before she even said a word, she was served with a letter from François Houle, the university's vice-president, containing a thinly veiled threat that she could face criminal charges if she proceeded with her speech. On the night of her speech, an unruly mob of nearly 1,000 people, some of whom had publicly mused about assaulting her, succeeded in shutting down her lecture after overwhelmed police said they could not guarantee her safety. Honourable senators, it was the most un-Canadian display that I personally have seen in years. It was so shocking that hundreds of foreign news media covered the fiasco, from the BBC to The New York Times to CNN. It was an embarrassing moment for Canada because it besmirched our reputation as a bastion of human rights — a reputation hard won in places like Vimy Ridge, Juno Beach and Kandahar. More important than international embarrassment is the truth those ugly news stories revealed. Too many Canadians, especially those in positions of authority, have replaced the real human right of freedom of speech with a counterfeit human right not to be offended. An angry mob is bad enough. That may be written off as misguided youth, overcome by enthusiasm. However, such excuses are not available to a university vice-president who obviously wrote his warning letter to Ms. Coulter after careful thought. Ann Coulter is controversial, she is not to everyone's taste, but that is irrelevant because freedom of speech means nothing if it applies only to people with whom we agree. To quote George Orwell: "Freedom is the right to tell people what they do not want to hear." In a pluralistic society like Canada, we must protect our right to peacefully disagree with each other. We must allow a diversity of opinion, even if we find some opinions offensive. Unless someone counsels violence or other crimes, we must never use the law to silence them. Freedom of speech is as Canadian as maple syrup, hockey and the northern lights. It is part of our national identity, our history and our culture. It is section 2 of our 1982 Charter of Rights and Freedoms, listed as one of our "fundamental freedoms;" and it is in the first section of Canada's 1960 Bill of Rights. Honourable senators, our Canadian tradition of liberty goes much further back than that. In 1835, a 30-year-old newspaper publisher in Nova Scotia was charged with seditious libel for exposing corruption amongst Halifax politicians. The judge instructed the jury to convict him. At that time, truth was not a defence. The publisher passionately called on the jury to "leave an unshackled press as a legacy to your children." After only 10 minutes of deliberations, the jury acquitted him. That young man, of course, was Joseph Howe, who would go on to become the premier of Nova Scotia. Our Canadian tradition of free speech is even older than that. It is part of our inheritance from Great Britain and France. The free communication of thought and opinion is one of the most invaluable rights of the man; any citizen can thus speak, write, [and] print freely. . .
France has produced some of the most well-known defenders of free speech in the world. François-Marie Arouet, better known by his pen name, Voltaire, was a polemicist who used satire and criticism to press for political and religious reforms. He paid a personal price, facing censorship and legal threats. Voltaire put it best when he famously wrote, "I disapprove of what you say, but I will defend to the death your right to say it." His passionate advocacy helped shape liberty on both sides of the Atlantic. English Canada has an impressive legacy of free speech, too. Like Voltaire, John Milton, the great poet who wrote Paradise Lost, was constantly hounded for his political views. His 1644 pamphlet on free speech, Areopagitica, perhaps the greatest defence of free speech ever written, is as relevant today as it was 350 years ago. In it, Milton wrote, "Let Truth and Falsehood grapple; who ever knew Truth put to the worst, in a free and open encounter?" and, "He who kills a man kills a reasonable creature, but he who destroys a good book kills reason itself . . ."
Yet, despite our 400-year tradition of free speech, the tyrannical instinct to censor still exists. We saw it on a university campus last week, and we see it every week in Canada's misleadingly named human rights commissions. This week in Vancouver, a stand up comedian named Guy Earl has been on trial before the B.C. Human Rights Tribunal for the crime of telling jokes that someone did not find funny. An audience member who heckled him is suing him for $20,000 because she found his retorts offensive. They may have been offensive, but what is more offensive is that a government agency would be the arbiter of good taste or humour. Nobel Prize winner Alexander Solzhenitsyn was sentenced to eight years of hard labour for telling a joke about Stalin's moustache. It is a disgrace that Canada is now putting comedians on trial. There is not a lot that the Senate can do about the B.C. Human Rights Tribunal, but our own Canadian Human Rights Commission has egregiously violated freedom of speech without any shame. In a censorship trial in 2007, a CHRC investigator named Dean Stacey testified that, "Freedom of speech is an American concept, so I don't give it any value." He actually said that. The Canadian Human Rights Commission actually admits they do not give free speech any value. That is totally unacceptable. Freedom of speech is the great non-partisan principle that every Member of Parliament can agree on — that every Canadian can agree on. I will never tire of quoting the great Liberal Prime Minister Wilfred Laurier when he said that Canada is free and its freedom is its nationality. I will readily give credit to Keith Martin, the Liberal MP from British Columbia, who two years ago introduced a private member's motion to repeal the censorship provisions of the Canadian Human Rights Act. 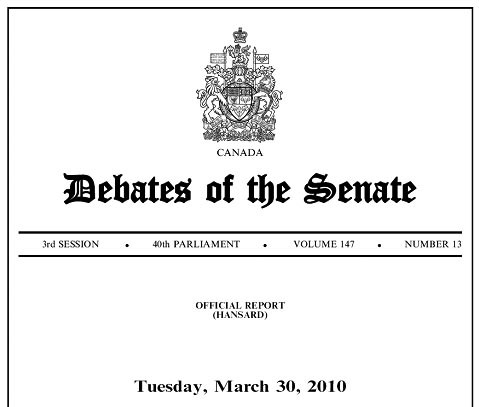 Honourable senators, I call for this inquiry to accomplish five things: first, to reaffirm that freedom of speech is a great Canadian principle that goes back hundreds of years; second, to put Canada's censors on notice that their days of infringing upon our freedoms with impunity are over; third, to show moral support for those who are battling censors; fourth, to inquire into the details of what went so desperately wrong at the University of Ottawa to ensure that those awful events never happen again; and, fifth, to inspire a debate that hopefully will lead to a redefinition of section 13.1 of the Human Rights Act. Honourable senators, there are times for partisan debate when parties must naturally be at odds with one another. This is not one of those times. Freedom of speech and respect for differing views is a foundational principle of our entire parliamentary system — indeed, of our entire legal system, as well. I look forward to the constructive comments of my friends and colleagues on both sides of the aisle to build on the bipartisan history that Canadian free speech enjoys. If we can rededicate our Parliament to protecting this most important right, we will have done our country a great service, but if we fail to stop and indeed reverse this erosion of freedom, we will have failed our most basic duty, the duty to uphold our constitution and the rights in it, the rights it guarantees for all Canadians. I know that, like so many generations of Canadians before us, we will meet the challenges of our time and live up to our responsibility to pass on to our children the same freedoms that we inherited from our parents. God keep our land glorious and free.